??? Is he back? Long serving member of FanUp...? Hide 765 comments... Click to show. Lmao spammer. Never seen you, you dead? @King_Ra- I don't mean to be offensive. Sorry =/. @DaTest9 - How was that contest a tie? I don't get it. Join the Minecraft Building Contest! Well my best answer is that your not on most of the time. Thanks for the help bro,true mod. dat do you have skype? id like to talk to you about the event some more before it goes live. Thanks for stealing my idea of player made contests!!! (just kidding) way to go man,nice job.im going to try (even though its the first time ive ever played this game)and hey when do the zombie things strike? oh snap look who is back on fanup and 2nd place in lifetime leaderboard :O u in for weekly board too? Hey everyone. I'm going on vacation for two weeks so I'll be on only for little bits of time. If you need help with anything post it on my page and I'll try to get back to you if possible. See you soon! hey dude are u admin omg! hey Dat, we're working out some beta award details now, should be very soon. You got 2k for those miniguides? Hey Dat, iv been looking though my back log of guides and I don't see any pending guides for you, I may have misplaced the link. could you email them to me again? Yo dat, I'll look over your new guides soon as i get a chance. Also, you deleted me from your xfire... I sent another friend request, would you mid accepting? lol you were posting stuff which werent relative to A.V.A at all, such as '' 0.3 sd watch out for this pro '' '' I'm making a minecraft server soon '' i didn't flag it as an Abuse though, i'm just saying. Does Minecraft take Ultimate Game Card? Hey dude finally got back to you on those guides, great work! I sent you a details in my e-mail. Hi Datest9. Splooshi is taking care of the guide points so you won't need to post on my comments. Thanks! gratz on becoming a Moderator! I already read the new blog post concerning $200. Thanks. why u not on xfireez? I am now a moderator. danoop10, are u on xfire? Can you go back and edit your minecraft videos, grab the embed code rather than the URL for your videos. That way they play in the page. I fixed the first one for you. Do you like square icon we are using for minecraft or can you suggest something better? hey wats up ^~^ you play AVA too? Congrats. Nice run at the wire. FanBucks in your account. the admin and i already had a discussion about this. all my points right now are legit. he did a spam last night and took 2k points away. gg? LOL? you dupes are NOT deleted. Look at your contents, you only have about 2pages of contents which does not add up to 10k. my dupes are deleted. and jorja, i get points counting for one post, but ny browser reposts data as spam. i already emailed admin about it. 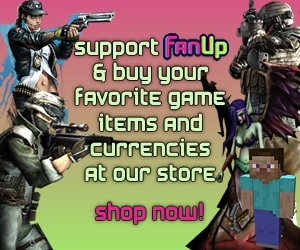 i can guarantee you that, when your dupes are all deleted you will have no more that 5k FanCoins. LOL, so many comments, btw "what is working?" DaTest, look out. Sorja is catching up. Conxept, do you play AVA? lol now you're spamming links too? pretty sad bro.